Let’s meet in Moscow at the Dairy&Meat Industry trade show! Food processing and packaging represent a key component of Russia’s economy. is the ultimate answer for the most demanding customers. Let’s meet at IMA Booth to discover and show you our almost unlimited packaging solutions for the Food & Dairy industry. With its long term experience in filling liquid to pasty products into different kind of cups (pre-formed and thermoformed) and pouches, IMA offers a large variety of different filling possibilities. Covering all aspects of the packaging process – from consultancy and design to production planning and turnkey solutions, IMA provides equipment for filling in pre-formed cups or in thermoformed cups. Millions of people worldwide are supplied daily with fresh, healthy products by the food and dairy industry. Products must be packed quickly and hygienically to make sure consumers will always find appetizing products packed in cups in the supermarket. Considering all requirements in the yoghurt, dessert and beverage sectors, and with decades of specific experience, IMA plays a role as primary technological partner and business advisor in all areas of packaging for such products. The broad knowledge gained globally enables IMA specialists to optimise customers‘ investments and ensure ongoing assistance and technological developments to maintain their competitive advantage. IMA supplies a broad selection of high performance equipment for pouches and spouted pouches. 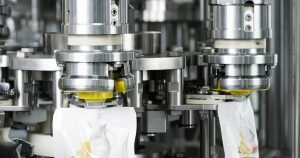 Focusing on production efficiency, repeatability and ensuring precise filling, sealing and capping operations, each solution is designed to provide maximum flexibility, fast size changeovers and a huge variety of pouch shapes and dimensions. 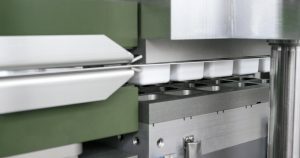 Machine design based on a modular concept also enables opportunities for process flexibility and makes each solution adaptable to specific needs. Continuous rotary motion combined with exclusive technologies for improved pouch handling developed by our engineers enable superb productivity while providing accurate results and a choice of processing methods to satisfy all customers. A convenient solution for fruit juices, baby foods and many other food and beverage products, the complete range of pouch filling and sealing equipment is versatile and highly reliable. Our team of industry experts are ready to assess your needs and define the best solution.